Kidney stones are a very common health problem. They form from the chemicals in urine, such as uric acid, phosphorous, calcium, magnesium, and oxalic acid. Medically referred to nephrolithiasis, stone formation happens when salts and minerals in the urine become crystallized by sticking together. These crystals continue to aggregate and build up over a few weeks or months into hard rock-like deposits or stones. Kidney stones range in size from a fraction of an inch to several inches. Small kidney stones (0.2 inches or less than 5 mm) can pass through the urinary tract and out of the body with little or no pain. However, larger stones can be quite painful, block the flow of urine, and cause blood in the urine and other symptoms. Kidney stones are quite common, with around 3 in 20 men and up to 2 in 20 women developing them at some stage of their lives. This condition also has a geographical prevalence (i.e., the “stone belt” is the southeastern states of the United States). Men are more prone to kidney stones than women, and they are most likely to occur between the ages of 20 and 50, according to the National Kidney Foundation. Calcium Stones: Excessive amounts of calcium in the urine accounts for 80 percent of all kidney stones. These calcium stones are formed when the calcium that is not used by the bones and muscles combines with other substances, such as oxalate and phosphate, in the urine. To a lesser extent (20 percent), calcium stone formation results from the lack of adequate calcium excretion by the kidneys. Struvite Stones: These stones develop in the wake of an infection and comprise magnesium and the waste product ammonia. Struvite stones can grow to be quite large rather quickly and thereby cause urinary blockages. These stones are mostly prevalent in women who are prone to urinary tract infections. They are predominantly seen in individuals with chronic indwelling urinary catheters, those who are debilitated, and those who have special bacterial infections (the bacteria often are Proteus mirabilis and Providencia). Uric Acid Stones: Such stones are more common in men than women, with elevated blood uric acid levels (hyperuricemia), a high-protein diet, and dehydration (insufficient water intake or excessive loss of fluids). You may inherit certain genetic factors that predispose you to this problem. Hyperuricemia may be the result of chemotherapy treatment for certain cancers in which, when the cells die (lysis), large amounts of uric acid are released. Cystine Stones: Cystine stones are relatively rare and usually develop in people grappling with a genetic disorder that goes by the name of cystinuria. Cystine is an amino acid that occurs naturally in the body. Cystinuria is characterized by an increased excretion of this amino acid from the kidneys such that the urine contains unusually high levels of cystine. One of the functions of the kidneys is to remove waste and fluid from your blood, which are filtered and excreted in the form of urine. Kidney stones occur whenever there is an excess of crystal-forming waste substances in your urine and a lack of water needed to dissolve them. Kidney stones are a common occurrence in people who make less than 1 liter of urine per day. People with hypercalciuria/hypercalcemia (excess levels of calcium in the urine/blood) figure among those individuals with an elevated risk for nephrolithiasis. Hypercalciuria can result from medical conditions such as hyperthyroidism, hyperparathyroidism, sarcoidosis, and malignancies such as multiple myeloma and bone invasion by a tumor. There are also cases in which cause for the stones is unknown (idiopathic). Prolonged or excessive intake of calcium or vitamin D supplements can dangerously increase calcium levels in your blood and urine, paving the way for calcium crystallization in the kidneys. Consuming large amounts of oxalate-rich foods such as spinach, nuts, chocolate, and certain teas can lead to hyperoxaluria or excess levels of oxalate in the urine. These excessive oxalates then bind with calcium. People who cut back on their dietary intake of calcium in the hopes of preventing kidney stones might end up making themselves increasingly vulnerable instead. Lack of dietary calcium intake can trigger the parathyroid glands to activate the resorption of bone, resulting in hypercalcemia and increased risk of calcium stones. Hyperuricemia can increase the risk of gout or uric acid stones. Uric acid stones are an imminent threat for people suffering from hyperuricosuria, a medical condition associated with problematic uric acid metabolism. 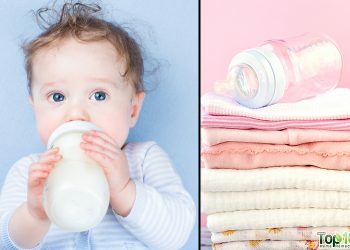 Cystinuria is a rare genetic disorder characterized by excess production of cystine, which can eventually lead to the development of cystine stones. Kidney stones may run in your family (familial). People with poor fluid intake or dehydration tend to have increasingly acidic urine, which is conducive to the formation of kidney stones. 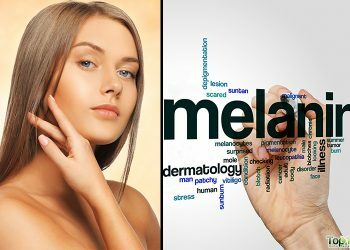 This is particularly true for people who live in warm climates and are prone to increased evaporation and perspiration via the largest organ of the body, the skin. Structural problems (such as cysts, remnants, and appendages) that cause pooling of urine and infection in the kidney may also cause kidney stone formation. Some medications taken for other conditions, such as diuretics (thiazides), calcium-based antacids (Rolaids), antiretroviral medications, and seizure medications (Topomax), can lead to kidney stone formation. Kidney stones are more prevalent among men than women. Unrestricted consumption of sugar-rich or phosphate-rich foods has also been linked with an increased incidence of kidney stones. Eating a diet that runs high on sodium can increase the amount of calcium your kidneys must filter, thus making you increasingly susceptible to kidney stones. People who have grappled with gastric bypass surgery, inflammatory bowel disease, or chronic diarrhea often undergo changes in their digestive process that adversely affect the absorption of calcium and water in the body, increasing the risk of stone formation. People aged between 30 and 50 are the most commonly affected by the scourge of kidney stones. Overweight and obese people are also more susceptible to this problem than people who weigh within the optimal limits. Other medical conditions that can precipitate the development of kidney stones include renal tubular acidosis, milk-alkali syndrome, and prolonged immobilization. People who are in the habit of eating a high-protein diet that runs low on fiber and magnesium are also likely victims. People with certain structural deformities in the urinary tract that cause the pooling of urine and infection in the kidney are also at an increased risk of nephrolithiasis. Kidney stones can form in either one or both kidneys and can grow to different sizes, ranging from as small as a grain of sand and pea-sized to as large as a pebble. On occasion, the dissolved salt and minerals within the kidney can combine to give rise to relatively large stones that are the size of a golf ball! So long as the kidney stone remains immobile within the kidney, it is unlikely to trigger any pain or other noticeable symptoms. Detecting the presence of such stones is usually a happenstance wherein it is picked up by an X-ray or scan done for another reason (if calcium based). However, if the kidney stone starts to move around within the kidney or passes into the ureter, the tube that carries urine from the kidney to the bladder, you are likely to experience bouts of excruciating pain in and around the flanks known as renal colic. Not everyone with kidney stones has to brave out this pain. If your stone is small enough, chances are you might pass it out of the urinary tract without even noticing it. However, larger stones can be more difficult and painful to eliminate through your urine. As these considerably sized stones move down the narrow and delicately structured ureters, they can cause painful spasms and irritation. Moreover, as the stone travels along the urinary tract, it can obstruct the natural flow of urine, causing inflammation in the kidneys. The swelling, in turn, activates the nerves to send signals to the brain that are interpreted as an intense, visceral pain located between your shoulder blades. Safe to say, the larger your stone, the more distressingly conspicuous the symptoms. Although the pain associated with kidney stones is not persistent and usually comes in waves, it can be severe enough to warrant a visit to the emergency room. Moreover, the intensity and location of the pain may change as the stone makes its way through the urinary tract. After conducting a physical exam and a comprehensive assessment of your medical history, your doctor can conclusively verify the existence of a kidney stone by ordering a string of tests. These include imaging tests to check the kidneys, the ureters, and the bladder for stones. For instance, an abdominal CT scan helps ascertain the presence of a kidney stone, it’s location and size, signs of urinary blockage, and the state of the organs that make up the urinary tract and those that adjoin it. Unlike standard X-rays that often miss out on smaller kidney stones, or if they are not calcium based, a CT scan is largely effective in detecting even the tiniest anomaly. Similarly, an ultrasound of the kidney uses sound waves to create real-time images that can help detect kidney stones noninvasively. Ultrasound is preferred over CT scans in the case of pregnant women to avoid subjecting them to unnecessary radiation. X-rays, including an intravenous pyelogram (IVP) where dye is injected into the bloodstream before the X-ray, are taken. Another lesser-known imaging technique to visualize abnormalities of the urinary system involves injecting dye into an arm vein to outline the kidneys, ureters, and bladder. The movement of the dye as it passes through the urinary tract is monitored via X-rays (IVP) or by obtaining CT images (CT urogram). Of all these tests, ultrasound is the safest option as CT scans and IVP employ the use of dyes that can cause kidney infections, kidney dysfunction, or allergic reactions to the dye (radiocontrast) in people with an already compromised renal system. Additionally, certain medications can amplify the damaging effect of this dye on your kidneys. Thus, your radiologist should be informed about any medication that you are on before going for either of these tests. In conjunction with these urine and image tests, your doctor may test your blood for excessive levels of calcium, phosphorous, magnesium, uric acid, thyroid hormones, and parathyroid hormone, to evaluate kidney function, and to check signs of anemia or infection. Once the stone is excreted through the urinary passage, you will be required to deliver it to your doctor for further analysis. The doctor will examine the composition of the stone in the lab, which might reveal its probable cause. Once your doctor is equipped with all the necessary information, he/she can lay down an appropriate treatment plan for other stones that may be present as well as a plan to prevent a recurrence. If your kidney stone happens to be less than 5 mm in diameter, drinking ample amounts of water can be sufficient to excrete the stone naturally out of your system without any medical intervention. In fact, everyone is recommended to drink at least 6 to 8 glasses of water daily to increase their urine flow volumes. The pain associated with kidney stones is usually excruciatingly severe at its onset and may require carefully administered narcotic medications for relief. As the condition persists, the pain mitigates to a milder degree and can be managed by nonsteroidal anti-inflammatory drugs (NSAIDS), such as ibuprofen (Advil, Motrin IB), acetaminophen (Tylenol), and naproxen sodium (Aleve). If you have a known kidney disease, you must avoid ALL NSAIDS. The prolonged and excessive use of NSAIDs can cause kidney dysfunction. The doctor may also write down a prescription for an alpha-blocker, which works by relaxing the muscles of the ureter to facilitate easy and painless passage of the stone. The stone is too large to pass on its own. The stone leads to severe pain or bleeding. The stone gets stuck within the urinary tract in such a way that it blocks the flow of urine, potentially causing an infection. Extracorporeal shock wave lithotripsy (ESWL) involves the use of lithotripters or lasers to generate targeted high-energy shock waves. These waves are directed at the kidney stone under imaging guidance, leading to the disintegration of large stones into smaller fragments that patients pass on their own. Smaller stones in your ureter or kidney can be directly removed from the ureter by using a ureteroscope, a fine instrument inserted into the ureter via the bladder. Percutaneous nephrolithotomy is a minimally invasive procedure that involves the insertion of a needle-thin instrument called nephroscope through a small incision in your back that is made to create a passage to the kidneys. This instrument has a camera on the tip and can be used to locate and break up kidney stones or remove them altogether. Your doctor may feel the need for surgery to remove benign tumors from the parathyroid glands to stop the overproduction of parathyroid hormones that often results in calcium phosphate stones. Drink Enough Water to Keep the Urine Diluted: Insufficient water intake can put you at a higher risk of developing kidney stones. Dark-colored urine that persists throughout the day indicates concentrated urine and lack of adequate water intake. A healthy adult must try to drink at least 6 to 8 glasses of water daily. Do not forget the loss of water through your skin (evaporation) via heavy exercise (sweating), saunas, and hot yoga. Eat Calcium-Rich Foods to Reduce Oxalate Levels: Less calcium in your diet increases the oxalate levels in the body, which may cause kidney stones. Dietary calcium binds with oxalates in your intestine, which prevents both from being absorbed into your blood and subsequently getting transferred to your kidneys. So, include calcium-rich foods such as dairy products, calcium-fortified nondairy milk, and kefir in your diet. Limit Oxalate-Rich Foods: Eating oxalate-rich foods in high amounts can increase your risk of kidney stones. Limit Salt Intake to Reduce Sodium Level: Sodium-rich foods can support the formation of kidney stones by increasing the calcium content in your urine. Eat a low-sodium diet to reduce your risk of kidney stones. The recommended amount of salt is no more than 5 grams a day. Limit Sugar and Artificial Sweetener Intake: A high sugar intake (such as high-fructose corn syrup drinks) creates an imbalance in the mineral relationship of calcium and magnesium absorption. 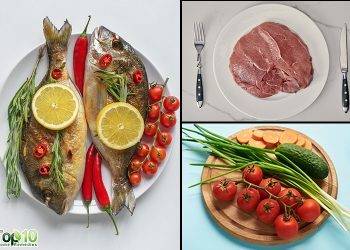 Limit Red Meat Consumption: Red meat is high in purines, which can lead to a higher production of uric acid in your body. It lowers your overall urine pH, making it more acidic. A high acid concentration in urine leads to uric acid kidney stones. Exercise Daily to Maintain a Healthy Body Weight: Being overweight increases your risk of developing kidney stones, so include exercise in your daily routine to drop some pounds and maintain a healthy weight. Avoid Soda and Carbonated Drinks: While water is good for your kidney health, drinking soda and carbonated drinks in excess is associated with stones. Sodas contain phosphoric acid that acidifies your urine, which may lead to stone formation. Avoid Use of Fluorinated Water: Drinking fluorinated water may also increase your risk of developing kidney stones. There is controversy regarding fluorinated water and stone formation. To avoid these problematic situations, you can drink bottled water or have a reverse-osmosis system installed in your home to remove fluoride from your water. Eat Plenty of Fruits and Vegetables: Magnesium is very important for your body’s absorption and assimilation of calcium. It also helps prevent calcium from combining with oxalate, which is a key factor in kidney stones. If you are prone to kidney stones, eat at least five servings of fruits and vegetables every day. Avoid red beets and spinach. Limes and lemons (limeade and lemonade) are high in citrate. Citrate is involved in the prevention of crystallization and stone formation. If you feel that the pain and discomfort have exceeded your threshold, seek the help of your healthcare provider who can guide you through the ordeal in the best possible way. Your doctor will refer you to a urologist to manage stones that are too big, incapable of passage, or associated with complications (hematuria, infection). Kidney stones that remain inside the body for too long can lead to many complications. For as long as the kidney stone remains lodged within the ureter, you may continue to excrete reduced or insufficient amounts of urine from the body. Such prolonged urinary obstruction can pave the way for subsequent kidney infection and chronic renal damage. In addition to conventional medications, a majority of cases of kidney stones can be treated with the help of natural ingredients. Many of them also help prevent stones from developing in the future. Moreover, make sure to drink plenty of water. If you drink 6 to 8 glasses of water along with other kinds of fluids daily, the color of your urine will become clear, which is a good sign. 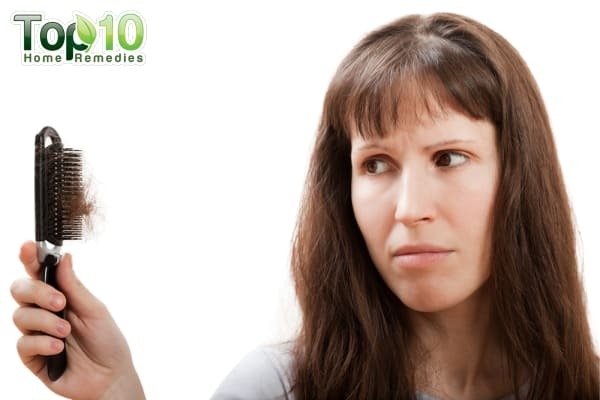 Here are the top 10 home remedies for kidney stones. Also, do consult your doctor for proper diagnosis and treatment. The combination of lemon juice and olive oil is traditionally used as a home remedy to expel gallbladder stones, but it can also be used to treat kidney stones. The citric acid present in lemon helps break down calcium-based kidney stones and stops further growth of a stone. A preliminary study published in the Journal of Urology found that patients who were treated with lemonade therapy for a mean of 44.4 months demonstrated increased urinary citrate levels and their stone formation rate decreased from 1.00 to 0.13 stones per patient per year. Take 4 tablespoons or 1/4 cup of fresh lemon juice. Add an equal amount of olive oil. Drink this mixture followed by plenty of water. Do this two to three times a day, for up to three days. You need not continue this remedy if you pass the stones in a single dose. Warning: This remedy may not be suitable for passing large kidney stones. Make sure you consult your doctor before taking this remedy. Nettle leaf helps maintain the flow of water through the kidneys and bladder, thus promoting smooth urination. Nettle leaf also helps keep crystals from forming into stones and keeps bacteria away. Nettle tea will also enhance the benefits of water by acting as a natural diuretic. A study published in Molecular Medicine Reports found that the methanol extract of Urtica dioica efficiently dissolves calcium oxalate renal stones in male Sprague-Dawley rats. The extract showed a dose-dependent curative effect on urinary and renal parameters, including calcium oxalate renal stone formation. This study was not duplicated in humans. Add 2 teaspoons of dried nettle leaf to 1 cup of hot water. Let the dried nettle leaf steep for 10 minutes and then strain the liquid. Drink 2 to 3 cups of nettle tea daily for several weeks. Note: Avoid stinging nettle if you are pregnant or breastfeeding. Use nettle with precaution if you are diabetic, suffering from hypertension, or taking lithium, blood-thinning, or sedative medications. Dandelions can come in handy for bolstering the excretory system. Not only does it promote urine output, but this taproot perennial is also known to replenish the potassium that is flushed out with the urine. Dandelion root juice has earned the reputation of a detox drink for its ability to stimulate the production of both bile and urine. This cleansing property can be attributed to a certain compound present in dandelion root that helps rid the body of waste. You can purchase dandelion tea that is readily available in supermarkets and drink 3–4 cups of this tea every day. Alternatively, you can extract fresh dandelion juice and supplement it with a bit of orange peel, apple, or ginger to make it more palatable. Drink 3–4 cups of this tea throughout the course of your day. You can even take dandelion extract in pill or capsule form. The recommended dosage of dried dandelion extract to ease the symptoms of kidney stones or prevent their formation is 500 mg. However, check with your doctor first to avoid any undue side effects. Note: If you have allergies with ragweed and related plants (daisies, chrysanthemums, marigolds), then you are also likely to be allergic to dandelion. Be sure to check with your healthcare provider before taking dandelion. Use dandelion with caution if you are taking antibiotics, lithium, or medications changed by the liver. Both the seeds and juice of pomegranate can help in the treatment of kidney stones. Try to eat one whole pomegranate or drink 1 glass of freshly squeezed pomegranate juice daily. You can also mix pomegranate in your fruit salad. Another option is to grind 1 tablespoon of pomegranate seeds into a fine paste. Eat this paste along with a cup of horse gram soup once daily. This remedy helps dissolve the stones. You can find horse gram in Indian markets. Watermelon is a great way to treat kidney stones composed of calcium, magnesium, phosphates, and carbonates. The potassium present in watermelon is an essential ingredient for healthy kidneys. It helps regulate and maintain the acid level in the urine. A study published in Biomedicine and Pharmacotherapy found that an in vivo rat model of urolithiasis showed reduced calcium oxalate (CaOX) crystal count in both the kidney and urine after administering the pulp extract of watermelon. Also, the serum analysis showed elevation in creatinine clearance and reduction in urea and creatinine levels. This study has not been reproduced in human studies. Along with potassium, watermelon also contains a high concentration of water, which helps in flushing out stones from the kidneys. Eating watermelon regularly can help greatly in the treatment and prevention of kidney stones. You can also consume watermelon seed tea. Being high in fiber and magnesium, kidney beans can be effective in the treatment of any kind of kidney or bladder problem, including kidney stones. A 2017 study published in the International Journal of Green Pharmacy demonstrated the antiurolithiatic activity of the ethanolic extract of P. vulgaris (kidney bean) seeds against ethylene glycol-induced renal calculi in Wistar rats. Remove the beans from inside the pods, and then put the beans in hot water. Simmer the water on low flame for hours until the beans become soft and tender. Strain the liquid and allow it to cool. Strain the liquid again. Drink this bean broth several times throughout the day to relieve kidney stone pain. This broth should not be kept for more than 24 hours, as it will lose its therapeutic properties. You can also eat kidney beans in a soup or salad. Wheatgrass juice may be an effective addition in the treatment of kidney stones. You can also have a glass of wheatgrass juice mixed with 1 teaspoon each of lemon juice and juice extracted from basil leaves. Take this juice two to three times a day. Wheatgrass juice is a good source of magnesium, potassium, iron, amino acids, chlorophyll, and B vitamins. Note: Use wheatgrass with precaution if you are diabetic. Stop taking wheatgrass as medicine at least 2 weeks before a scheduled surgery. Basil can help renal function in more ways than one. It contains acetic acid, a chemical that helps break down kidney stones into smaller bits, which are easier to excrete. Moreover, basil contains certain compounds that may prevent the formation of kidney stones (uric acid). What’s more is that basil juice is generously supplied with antioxidants and anti-inflammatory agents, both of which are beneficial. Mix 1 teaspoon each of basil juice and honey. Take this mixture daily in the morning for 5 to 6 months. If you do not like the taste of honey, you can take pure basil juice or chew two to three basil leaves daily. Another option is to drink basil tea. Steep five to six basil leaves in boiling water for about 10 minutes. Add 1 teaspoon of honey and drink this tea after it cools. The insoluble fiber found in wheat helps reduce calcium in the urine as it combines with calcium in the intestines, thereby eliminating it through the stool. Thus, it is essential to eat foods that are rich in fiber when suffering from kidney stones. When it comes to fiber-rich food, nothing is better than bran flakes. One bowl of bran flakes can provide 8 mg of fiber. So, to cut the risk of kidney stones, eat bran flakes daily without fail. Whole-grain foods such as bread can also help greatly lower your risk for kidney stones. Whole-grain bread is a rich source of nutrients, fiber, and protein along with magnesium. Magnesium especially can help prevent the coalescing of crystals in the kidney to form larger stones. So, those suffering from kidney stones should eat two to three slices of whole wheat bread daily to reduce the stones. Along with bread, eat whole-grain cereals, pasta, and so on to increase your intake of fiber and other nutrients to ward off kidney stones in the future. A glass of raw celery juice can help relieve pain from kidney stones due to its antispasmodic properties. Celery juice helps clear out toxins that contribute to the formation of kidney stones. Raw celery juice is also a diuretic, which means it increases the volume of urine and helps flush out the stones. Drink a glass of celery juice daily in order to prevent more stones from forming. You can also use celery seed to treat kidney stones. Drinking herbal tea made with celery seeds can help treat kidney stones resulting from uric acid accumulation. Try any of these natural remedies for symptomatic relief. If there is no improvement in your condition, consult your doctor. NKF Answers Top 10 Questions about Kidney Stones. The National Kidney Foundation. https://www.kidney.org/news/ekidney/november10/Top10_November10. Published March 3, 2017. Aggarwal R, Srivastava A, Jain SK. Renal Stones: A Clinical Review. Urology. https://www.emjreviews.com/urology/article/renal-stones-a-clinical-review/. Published January 2, 2018. Cheungpasitporn W, Rossetti S, Friend K, Erickson SB, Lieske JC. Treatment effect, adherence, and safety of high fluid intake for the prevention of incident and recurrent kidney stones: a systematic review and meta-analysis. Journal of Nephrology. https://www.ncbi.nlm.nih.gov/pubmed/26022722. Published April 2016. Curhan GC, Willett WC, Speizer FE, Spiegelman D, Stampfer MJ. Comparison of dietary calcium with supplemental calcium and other nutrients as factors affecting the risk for kidney stones in women. Annals of Internal Medicine. https://www.ncbi.nlm.nih.gov/pubmed/9092314. Published April 1, 1997. Ferraro PM, Taylor EN, Gambaro G. Soda and Other Beverages and the Risk of Kidney Stones. American Society of Nephrology. https://cjasn.asnjournals.org/content/8/8/1389. Published August 2013. Tracy CR, Best S, Bagrodia A, et al. Animal protein and the risk of kidney stones: a comparative metabolic study of animal protein sources. The Journal of Urology. https://www.ncbi.nlm.nih.gov/pubmed/24518789. Published July 2014. Lieske JC. New Insights Regarding the Interrelationship of Obesity, Diet, Physical Activity, and Kidney Stones. American Society of Nephrology. https://jasn.asnjournals.org/content/25/2/211.full. Published February 1, 2014. Ludlow M, Luxton G, Mathew T. Effects of fluoridation of community water supplies for people with chronic kidney disease. Nephrology Dialysis Transplantation . https://academic.oup.com/ndt/article/22/10/2763/1833116. Published July 27, 2007. Moulton C. Lemon Juice Prevents Kidney Stones in the Urinary Tract. NHRI. https://www.naturalhealthresearch.org/32315-2/. Published November 22, 2013. Alenzi M, Rahiman S, Tantry Bl A. Antiurolithic effect of olive oil in a mouse model of ethylene glycol-induced urolithiasis. Investigative and Clinical Urology. https://www.ncbi.nlm.nih.gov/pmc/articles/PMC5419107/. Published April 11, 2017. Kang DE, Sur RL, Haleblian GE, Fitzsimons NJ, Borawski KM, Preminger GM. Long-term lemonade based dietary manipulation in patients with hypocitraturic nephrolithiasis. The Journal of Urology. https://www.ncbi.nlm.nih.gov/pubmed/17382731. Published April 2007. Stinging Nettle Leaf (Urtica urens, dioica). Restorative Medicine. https://restorativemedicine.org/library/monographs/stinging-nettle-leaf/. Li N, Li K, Li P. Protective effect of Urtica dioica methanol extract against experimentally induced urinary calculi in rats. Biomedical Reports. https://www.spandidos-publications.com/mmr/10/6/3157. Published December 1, 2014. Salimi MYG-, Eidi M, Ghaemi N. Inhibitory effects of taraxasterol and aqueous extract of Taraxacum officinale on calcium oxalate crystallization: in vitro study. Renal Failure. https://www.ncbi.nlm.nih.gov/pmc/articles/PMC6014465/. Published April 5, 2018. Hosseinkhani A, Tabatabaei F, Jahromi MM-. Urinary Bladder Stone Passing Using a Persian Herbal Recipe. Journal of Evidence-Based Integrative Medicine. https://www.ncbi.nlm.nih.gov/pmc/articles/PMC5898657/. Published April 4, 2018. Ilbey YO, Ozbek E, Simsek A. Effects of Pomegranate Juice on Hyperoxaluria-Induced Oxidative Stress in the Rat Kidneys. Renal Failure. http://www.academia.edu/14170489/Effects_of_Pomegranate_Juice_on_Hyperoxaluria-Induced_Oxidative_Stress_in_the_Rat_Kidneys. Published 2009. Nirumand MC, Hajialyani M, Rahimi R. Dietary Plants for the Prevention and Management of Kidney Stones: Preclinical and Clinical Evidence and Molecular Mechanisms. International Journal of Molecular Sciences. https://www.ncbi.nlm.nih.gov/pmc/articles/PMC5877626/. Published March 7, 2018. Siddiqui WA, Shahzad M, Shabbir A, Ahmad A. Evaluation of anti-urolithiatic and diuretic activities of watermelon (Citrullus lanatus) using in vivo and in vitro experiments. Biomedicine and Pharmacotherapies. https://www.ncbi.nlm.nih.gov/pubmed/29145146. Published January 2018. Prasad KVSRG. Antiurolithiatic activity of Phaseolus vulgaris seeds against ethylene glycol-induced renal calculi in Wistar rats. International Journal of Green Pharmacy (IJGP). 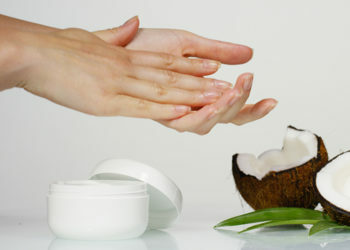 http://www.greenpharmacy.info/index.php/ijgp/article/view/1296. Published 2017. Kulkarni N, Kapse N, Pachori R. EUROPEAN JOURNAL OF PHARMACEUTICAL AND MEDICAL RESEARCH. EUROPEAN JOURNAL PHARMACEUTICAL AND MEDICAL RESEARCH. https://www.ejpmr.com/home/abstract_id/2748. Published July 2017. Rana S, Kamboj JK, Gandhi V. Living life the natural way – Wheatgrass and Health. Functional Foods in Health and Disease. https://ffhdj.com/index.php/ffhd/article/view/112. Published 2011. Han H, Segal AM, Seifter JL. Nutritional Management of Kidney Stones (Nephrolithiasis). Clinical Nutrition Research. https://www.ncbi.nlm.nih.gov/pmc/articles/PMC4525130/. Published July 31, 2015. Patchanee B, Jéhanno E, Savage GP. Total, soluble and insoluble oxalate content of bran and bran products. Childhood immunizations. https://pubag.nal.usda.gov/catalog/774936. Published 2009. Bahmani M, Ahmadi BB-, Tajeddini P. Identification of medicinal plants for the treatment of kidney and urinary stones. Journal of Renal Injury Prevention. https://www.ncbi.nlm.nih.gov/pmc/articles/PMC5039998/. Published July 27, 2016. Home Remedies for Kidney disease. I need advice big time. I saw my doctor today and he told me that I have Kidney disease. So now I have to see a Endocrinologist and Nephrologist Drs. Is there anything that I can take to help? Very informative and easy solutions to the kidney problems ESP stones…all the general public needs to be informed of such benefits of natural products.. I had a 6mm size on my right uretor and my doctor gave me Epimag solution and Omnic ocas(alpha blocker) for 1 week. I tried home remedies also. lemon juice (two big lemons) with 2 table spoon Olive oil for first week and from second week onwards I tried Apple Cider Vinegar(organic) 2 table spoon with enough water two times a day. I never felt that the stone had passed. But after one month I had an ultrasound scan and, my luck, the stone passed.I dont know which medicine worked for me. Thanks for Home remedies! and my doctor! Take 500 g of deseeded french beans and 2 litres of water. Keep the flame low and let the combo get heated up for two hours. Then cool it , blend it and drink the mixture. After this, drink three litres of water within three hours. It will work wonders. My husband who had been advised ureteroscopy, passed an 8 mm stone with no pain at all because of this. Sir, what types of Basil you reccommended for this pupose because there are different types of Basil ? In my native place small leave and light blakish basil is availabled. Doctor, Thanks for this nice article on treatment for kidney stones. 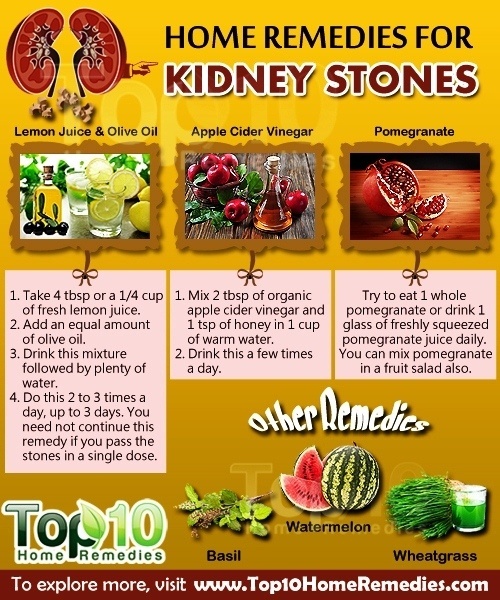 I will practice those steps to eliminate kidney stones which developed because I was taking insufficient water while consuming large amounts of oxidants and vitamin D.
I have kidney stones due to dehydration . Thank you for the recommended remedies which I will follow. I have had kidney stone in my right side for about 4 years and so far no problems as I drink alot of water like 2 litres a day. I love drinking water than any other drink anyway. I am prone to infections in the bladder due to the kidney stone but antibiotics takes care of that. I have tried some of the above remedies but drinking lots of water is the best remedy for me. i have stone in my kidney and it pains alot oftenly.My parents and my lovely frnd name switty always force me to drink plenty of water daily with lemonade .it really works..i am also going to try above remedies . my dr. said i have several stones in my lower part of my kidney, not big enough to do anything about it. but she told me to drink plenty of water. i have passed 3 in the past 2mm 4mm & a 8mm yes 8mm stone and i kept that one as a testimony to what God did. i thank God for this web site and the remedies. i will try anything to get these pest out of me and to feel normal again.pray for me! I have 2 stones 3mm in both kidneys. I drink a lot of water, lemon juice and a safoof of Hakeem Saifullah of my city. This safoof really works. I started passing stones 8 so far, in my 40’s. Now at age 68 I have another. Doc said they call it a silent stone, lays there and suddenly starts to move…often it rolls back to where it was . He said going after it might cause damage. I read of treatment that has you drink 3 bottles of the darkest beer you an find. You drink 1 every 20 min. (3in 1 hour) I tried it 3 yrs ago and it worked. The beer numbs the urea tube and you’ pee like a racehorse. Why black? I don’t know, but I passed 3 stones. Now I don ‘t like beer and hate black, but it did the job. I think if you google Finland study and k stones, also univ Wisconsin and k stones, or black beer and k stones you can find the tests. I really need a remedy for my mothers health. She started experiencing this problem of recent. For two days she could not pass out urine each time she wants to pee. Now she can urinate freely but with some little particles of stones coming out with the urine. U can imagine the kind of pain she passes through before she pee. I have goggled thru for corn silk. they say it helps in stopping formation of stones and that’s what I need to confirm. Thanks for the help I’m diffiently going to give these ideas a try. thks for ur tips.. I got suffered pain from both the kidney one by one, right kidney one time got suffered and left kidney got suffered two times.,, consulted doctor, had medicine as suggested, had plenty of water as advised. I jst want to knw whether this issue is cureable or has to face again & again in future..
Thnx for such article.In this bsy life one does gets tme to look after onself properly bt by following some of these above facts we can avoid stones in kidney.I too hv a stone in my left kidney. My mother used to cook the stem of Banana tree once in a month which prevents forming the stones in any part at all and removes if any already there. kidney stone is very painful disease i operated it but create it very soon. doctors of all over india and world, requesting that will search medicine of dissolve stone. thank you very much for the article…god bless you.. Yes, in our bengali food habits we do eat the curry of banana stem(internal stem) but it was not known to us that it works on kidney stones and expels them.Thanks. 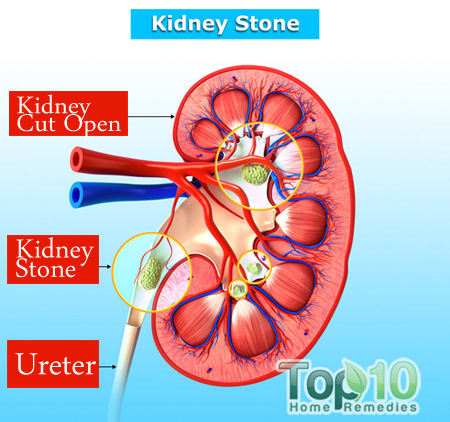 I have 10.6 mm stone in ureter , my right side kidney 1 minor and left side 3 minor stone is there.So pls suggest me can this home remedies help me to clear this kidney stones. The Lemon Juice and Olive Oil mixture really does work! I’ve had a number of Kidney Stones over the last 15 years. Not only does this mixture ease the pain, it seems to dissolve the stones fairly quickly and you end up passing them after drinking plenty of water! I highly recommend this based on my experience with it! How often do you have to drink this mixture, and then how quickly will the stone pass, after drinking the mixture? I have been to ER twice and Urologist once after hospital. All (3) times was given pain meds and instructed to drink plenty of water. I have been doing this for over a week now, and still have not passed the 4 mm stone. i have a kidne stone of 5 mm size in left kidney from which when the pain begin start day by day with a long time so please tell me a good remedies from which it can be delete with root i hope you will understand my problem. To much animal foods such as dairy and meat leads to metabolic acidosis whereby the body draws on the calcium from the bones to neutralise the excess acid. And offcourse excess calcium from this process can lead to kidney stones and other conditions such as osteoporosis. The best treatment for such conditions is to reduce or best cut out animal foods and increase the intake of whole plant based foods. Fresh vegetable juices are good. If Pickle juice worked, I bet jalapeno juice from the jar would destroy those little rocks!!! IT’S EASY TO PREVENT AND DESOLVE STONES. TAKE 500 MG OF MAGNESIUM CITRATE DAILY. YOU CAN ALSO TAKE POTASSIUM CITRATE BUT THE MAGNESIUM WORKS BETTER. TAKE BOTH FOR FASTER RESULTS. THEY ARE CHEAP MINERALS IN TABLET FORM AT YOUR SUPERMARKET OR DRUGS STORE. JUST MAKE SURE THEY ARE CITRATE. IT WILL SAY CITRATE ON THE BOTTLE.